ELKO, Nev. -- A fossil found in northeastern Nevada shows a newly discovered fish species that scientists believe looked, and ate, like a shark. 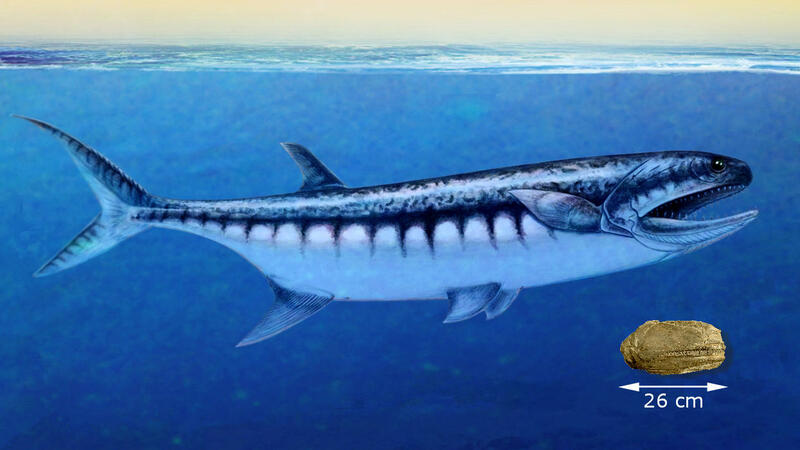 The fossil is what remains of a bony, sharp-toothed fish that would have been about six-feet-long (1.83 meters) with long jaws and layers of sharp teeth. The type of jaw and teeth on the fish suggest it would have chomped down on its prey before swallowing it whole, like a shark, the Reno Gazette-Journal reported. "The surprising find from Elko County in northeastern Nevada is one of the most completely preserved vertebrate remains from this time-period ever discovered in the United States," said Carlo Romano of the University of Zurich, lead author of a Journal of Paleontology article about the find. The fish, which researchers called Birgeria americana, predates Nevada's most famous fossil, the Ichthyosaur, by more than 30 million years. The Ichthyosaur was a 55-foot-long (16.76 meters) reptile. One of the largest concentrations of Ichthyosaur fossils was found near Berlin, Nevada. The find led to the Ichthyosaur becoming Nevada's state fossil. The Birgeria americana fossil finding is important because it sheds light on how quickly large, predator species evolved following the Earth's third mass extinction that preceded the Triassic period about 250 million years ago. The evidence shows the fish was alive and well about 1 million years after mass extinction 66 million years ago wiped out an estimated 90 percent of marine species. It also shows a large fish was surviving in water previously thought to be too warm to support such life. At the time, water near the equator, which is where land that became Nevada was positioned about 250 million years ago, could have been warmer than 96 degrees. "The eggs of today's bony fish can no longer develop normally" at such a high temperature, researcher said. Researchers learned of the fossil about five years ago after fossil collector Jim Jenks of West Jordan, Utah, stumbled upon it near Winecup Ranch north of Wells. "It was just a very lucky find," said Jenks, who was credited among the paper's authors. "I happen to notice the teeth glinting in the sun. That is what caught my attention." Jenks turned the fish over to the New Mexico Museum of Natural History and Science, which has a large collection of fossils and connections with leading researchers.